Save $3.95 when you add a Wheeler Front Sight Adjustment Tool for only $8 using the dropdown above! This tool makes it much easier to zero your sights! I have a Kel-Tec RFB-18 and a Kel-Tec RDB-17. A while back I purchased two AT3 Leos (red dot w/laser) and mounted on the Kel-Tecs, they work great. Then I ordered two AT3 45 degree off set sights for the Kel-Tecs. Very easy to mount, and seem to be of good quality. But I have not had them to the range yet, will do when it warms up and the snow goes away. Shipping was very fast. I am pleased with their products and service. I just finished building my .458 SOCOM from scratch. I searched for metal offset sights for awhile before coming across these. I kept searching cause all the other sites were over $150 per set. For the price of these I would buy them over and over! Sturdy, adjustable, and well within the budget. The peep holes are outstanding as well. The only thing I can't give a review on is how long they hold up and if they can take the beating of being in the woods, but I'm sure they won't disappoint! Great product!! Super Quick Point on Target a Quick Cant Of The Weapon and on Target Great Investment. I had been looking for a great option for offset sights on my 3 gun rifle and stumbled upon these. I will admit I upgraded them with a fiber optic front sight post which is amazing. The sights are well made and quite durable trust me I chuck my guns in the dump barrels harder than you would expect sometimes. It took a while to want to do this review, I had to know if they would hold up to the abuse that we put them through. 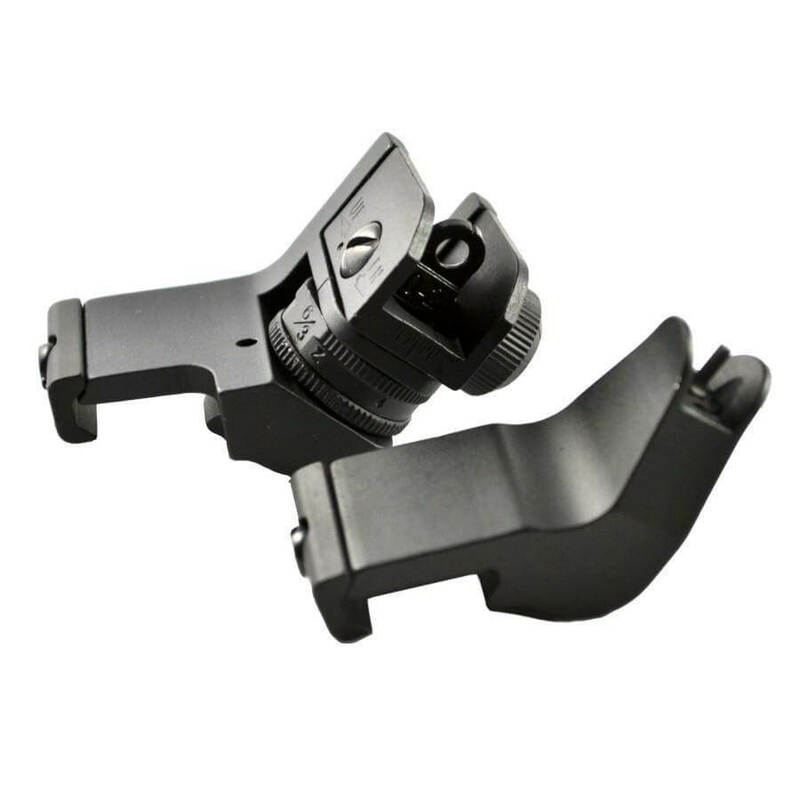 I can say that I don't think you can get a better more durable set of offset iron sights at this price point. My only complaint if you could even call it that is the front sight came and the finish on the mount was a bit messed up but it in no way affects the durability or strength of these. My competition guns are not show pieces as seen by how they get thrown around so this didn't bother me in anyway. Hopefully this helps someone who was like me trying to compare and find the best option, in my opinion you will be completely satisfied and glad you got these. I will try to add pictures later if possible. Shipped and received timely. Threads on inside of rear sight were somewhat stripped so I had to replace rear mounting screw with a longer one. Once replaced, mounting was solid. Otherwise seem to adjust fine. Looking forward to sighting in at the range soon.